Thomas Barr (left) and Justin Gatlin (right). 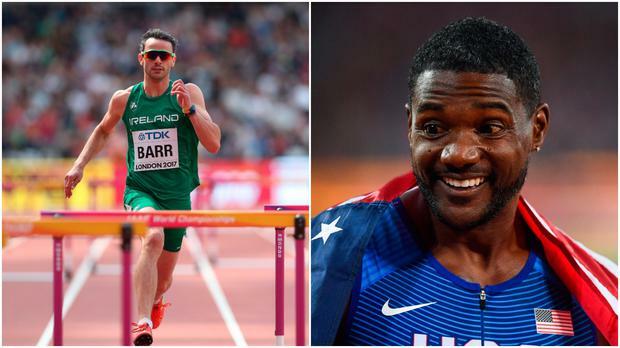 Justin Gatlin has firmly denied any wrongdoing after a newspaper investigation revealed that his coach offered to supply a reporter with performance-enhancing drugs, but Ireland 400m star Thomas Barr wasn't impressed with the sprinter's statement. Gatlin has previously served two doping bans after testing positive in 2001 and 2006, with the 2004 Olympic champion returning to the sport amid plenty of controversy. The American pipped Usain Bolt to win the 100m at the World Championships last summer, but a Telegraph investigation published on Monday has raised further questions about whether or not Gatlin is racing clean. Gatlin sacked his coach, Dennis Mitchell, on Monday night after the news broke, before releasing a statement where he distanced himself from the doping claims. "I am not using and have not used PEDs," Gatlin said. "I was shocked and surprised to learn that my coach would have anything to do with even the appearance of these current accusations. I fired him as soon as I found out about this." Many people still doubt Gatlin's innocence, and Irish athlete Thomas Barr pointed out one curious line in his statement on social media. "Correct me if I’m wrong, but have you not served two bans for PEDs?," he tweeted. "Granted the first ban was for medication since childhood. That still narrows it down to one..."